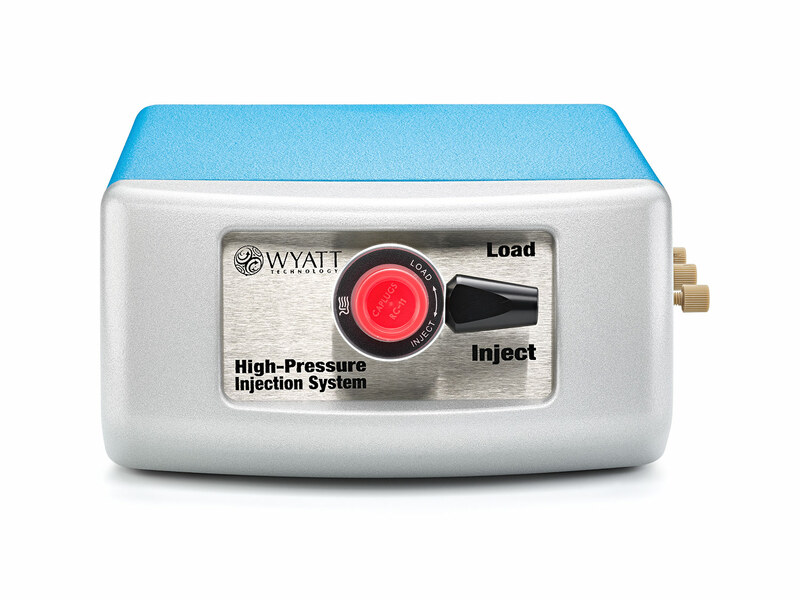 The Wyatt Injection System High-Pressure (WISH™) is ideal for SEC-MALS without an autosampler. Used like a standard injector valve, upon injection the WISH generates an autoinject contact-closure signal to the DAWN® or miniDAWN® MALS detector, read by ASTRA to trigger data collection. That's not all the WISH can do! It may also be used with an Optilab refractive index detector for the determination of dn/dc values in the "flowing batch" (i.e., flowing through a flow cell, but unfractionated) mode, or even to calibrate your Optilab against NaCl standards. And more: the WISH facilitates other types of flowing batch measurements such as Zimm Plot analysis (MALS vs concentration, to determine average solution molar mass and size, and second virial coefficients) with a MALS detector. The centerpiece of the WISH is a specially-designed injector module that makes flowing batch measurements a breeze. Connect your syringe pump or HPLC pump to the injector inlet, and follow up with your Wyatt MALS or RI instrument for a simple and super-stable measurement platform. The WISH Kit includes a 1 mL injection loop (standard, other sizes available upon request), a handful of syringes to help get you started, and an autoinject cable for connection to a Wyatt instrument. If you are a current US or Canadian Wyatt Technology customer, you can purchase the WISH online. Visit the Wyatt Technology Store today!